And now our brother in Christ, Lucas, is remembered over 500 years later. Thank you for the good work that you do, Eric. You bring the medieval world of ordinary people, not just the kings and queens, to life. Thanks for your comment. Sometimes the “other” side of medieval society steps out of the darkness, but it is not often this vivid. You are Erik! Forgive my misspelling. My son is also an Erik, born 1 month, 1 week and 500 years after dear Lucas. The past several weeks, I have been haunted by the idea of Legacy. I stumbled across this today and read it as I waited for the school bus to collect my own children. Five hundred years later, these children are remembered. There names still fresh on my lips, this brings me some peace. Eric: I do enjoy your posts so much and am in awe of your knowledge and computer skills. 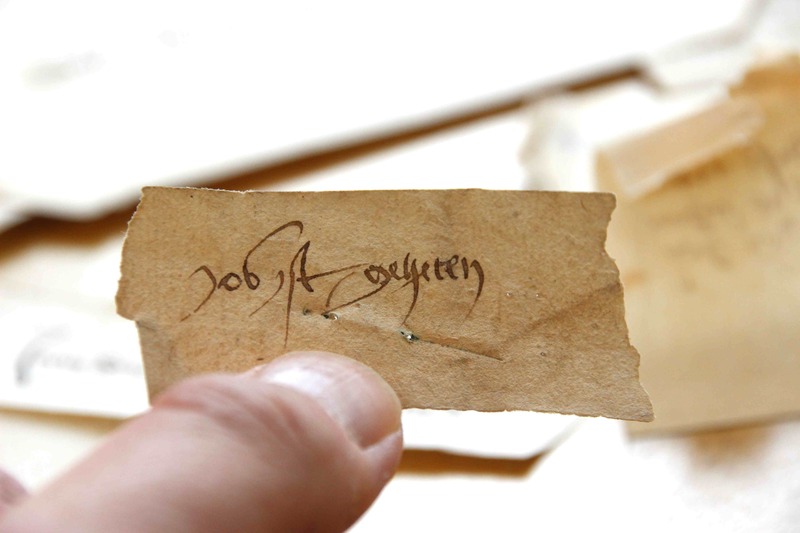 Most of the children described on the medieval name tags are not orphans, but foundlings. We will never know how many were reclaimed, if any. I’m a medievalist and an adopted child who was found in circumstances similar to these children — I found your post deepling moving. Thank you for sharing. Tragic and extraordinary – it’s so rare to catch a glimpse of childhood, sad that it has to be heartbreaking. Thank you so much for this. You do them honour with this post. You are welcome – the slips really impressed me when I looked them. I felt I just had to write about them. Triste y hermoso a la vez… gracias! Interesting post. Poignant materials. Many a slip. A lovely little piece. I wonder, though, why so many commentators assume that these foundlings were disadvantaged by being such? They had a roof, food, clothing, care and almost certainly education. In some cases they would have had better, possibly longer, lives because of being given up by their parent(s) than if they had stayed with them. I wonder if we are programmed to think of Victorian workhouse conditions when we hear about orphanages and foundling homes, because of literature (‘Oliver Twist’, for example) and the fact that they only get mentioned in the media in a modern context when they fail the children in their care? Bij fig. 9 vertaal je “onsser frouwen kerc” als “church of St. Peter”. Moet dat niet “church of Our Lady” zijn? Bedankt, je hebt helemaal gelijk. Een muur van die kerk staat er nog. Ik heb het aangepast. You may be right. The downside highlighted in the piece is related to the family drama behind these foundling cases. Thanks, also for you comment! I am reading 500 (‘v’ with ‘c’ above it) minus 10 (‘x’ in front ‘v’) plus 2 (‘ii’), equals 1492. 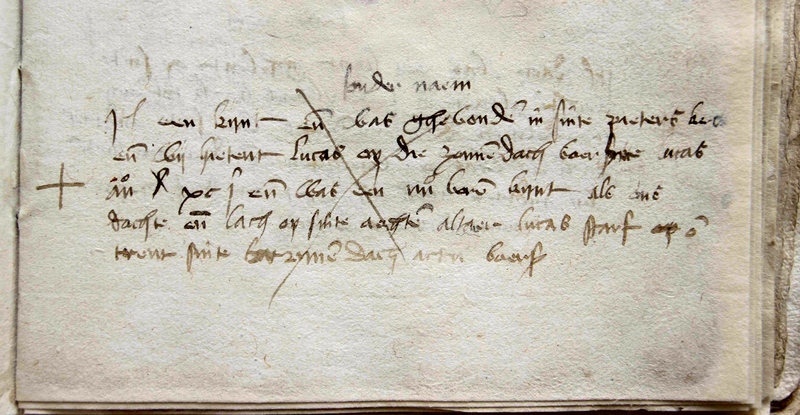 This fits with the chronology of the book and the dates of the other entries (1491 and 1492). 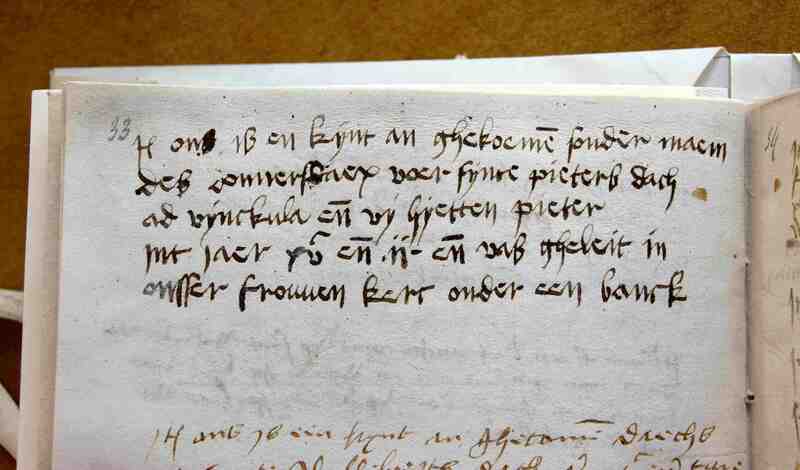 The entries are riddled with unusual spellings, as you can see from the transcriptions, although this may not be one. The normal numbering system in Leiden’s records is as I said. XV = 15 with a C above it = 1500 en[de] ii = and 2, which is 1502. 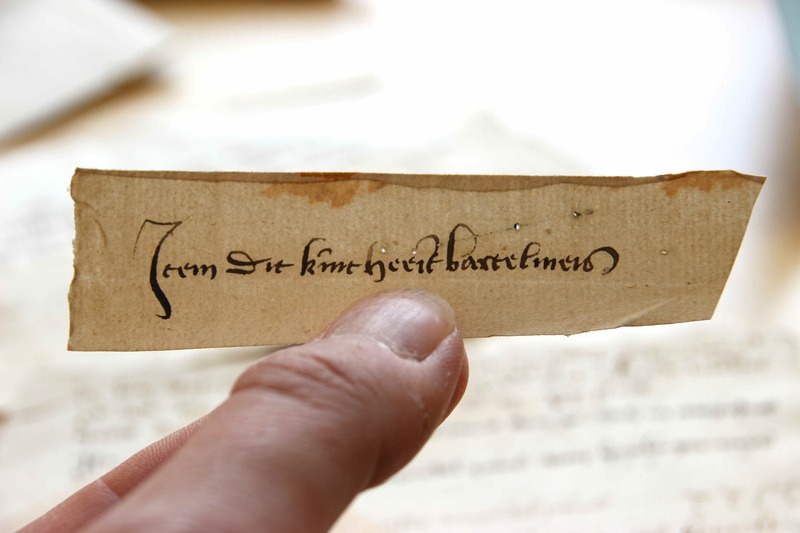 I’ ve read the Leiden Archival material through 1575. This is a recurrent way of writing dates, and I’ve never seen what you propose (but, of course, I don’t see it here either, which could simply mean it’s there but I’ve read it my way and not your way). Let me have a look into it. The reading I proposed is not unusual in manuscript colophon. Your reading is correct: I have updated the post. Thanks so much for the correction! Wat een prachtig verhaal. Ik vind het elke keer weer bijzonder hoe u de gewone middeleeuwer wat dichterbij brengt. Ik heb het via Facebook gedeeld. Dit verhaal bengt me wel bij de vraag: als deze ouders een briefje konden schrijven, met of zonder vele taalfouten, was de schrijfvaardigheid onder de armeren dan toch weider verspreid dan algemeen wordt aangenomen? Bedankt voor je aardige reactie. We zouden eigenlijk meer van dit soort briefjes moeten vinden en bestuderen om die vraag te beantwoorden, maar ook hoe arm mensen eigenlijk waren die kinderen ter vondeling legden. Schrift en spelling kan zeker helpen je interessante vraag te beantwoorden. 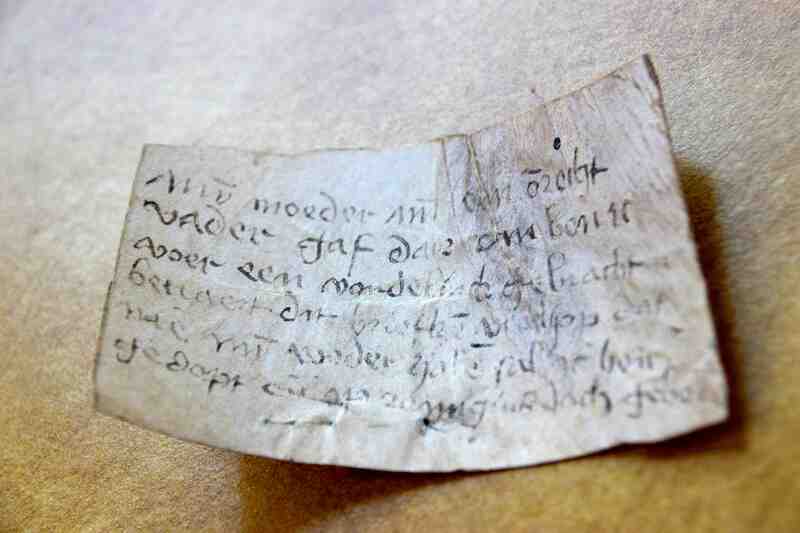 It looks like the tag on Fig 6 could have been sewn to a piece of cloth, don’t you think ? Possibly. There are two tags with such a series of tiny holes in them. It might seem too elaborate to stitch a paper on (rather than just pin it), but then again that may just be the explanation of the holes. Thanks for your input. De kerk 100 meter vanaf het weeshuis is niet de Pieterskerk, maar de Hooglandse Kerk. This is a very interesting look at ephemera and the stories it can tell! Wow, I never knew these existed! As you say, it is heartbreaking to think of the circumstances in which these tags were produced. Ja, die had ik reeds in eerdere versie verbeterd, maar die correctie is (met andere) door synchronisatieprobleem terug van weg geweest. Bedankt! Thanks for your comment Ramona! These couldn’t be other than deeply moving; thanks for your beautiful, learned, caring presentation. Thank Marc. I had the same initial reading (an exuberant bretzel s) but opted for the b because the ascender seemed a better fit for that letter. Happy to change it if you think this kind of s does appear with such a high ascender. You are welcome – thanks for visiting! You are welcome. Thanks for your kind remark. Erik, a couple of years ago I heard about an exhibition called Threads of Feeling, textile tokens from the London Foundling Hospital. The names of the children who came to this place were recorded along with a snippet of cloth from their own or their mother’s garment. 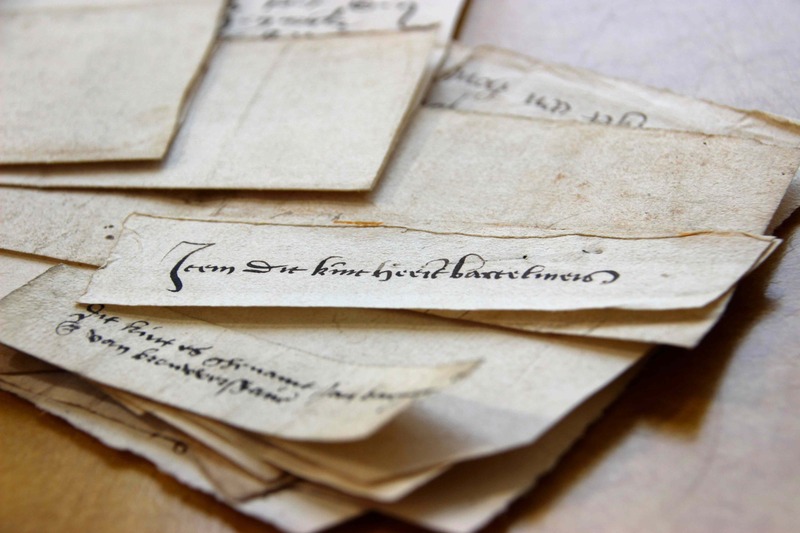 The register dates back to 1745, and the cloth bits are a wonderful and poignant archive (that also serves to illustrate common cloth, the day to day stuff that is largely missing from records). There was a good online introduction to the exhibition at the Foundling Museum’s website. I meant to say the Foundling exhibition archive complements this collection of name tags, poignant and painful, and so deeply human. Thanks for that. I was alerted to these slips by someone else but have not yet been able to trace them. With your extra details I will have another search. Thanks! http://foundlingmuseum.org.uk/exhibitions-collections/exhibitions-displays/past-exhibitions/ …scroll down the page to find a wee bit of info. there was a really good webpage with music a couple of years ago, that may still be there somewhere. I just so enjoyed this post. I am a story-telling, rather than a historian, and wonder at the vast and deep stories behind each of these name-tags…as you said in an earlier reply, not only the stories of these children but of their parents and the vast array of circumstances that led each child to the door of that orphanage. I agree, the tags do invite creating a good story around them, in part because of their brevity, but also because they provide the perhaps most personal of details regarding their carriers: their names. “My mother gave me an illegal father.” So poignant, as though the child blamed the mother. Society speaks, here, through the centuries. 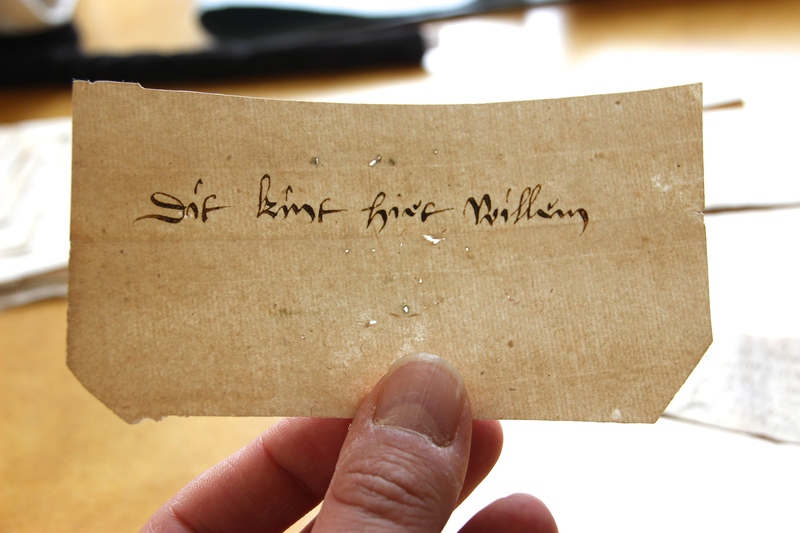 Erik, I recently found an ancestress who was a foundling (born around 1805). She was married in Zegwaart and on her marriage record, it was noted that she was a foundling…it did include her parents’ names, but I think they were adoptive parents, since they had different last names from hers. I was trying to find out more about Dutch foundlings and found your site. Fascinating. I am hoping to find more about my many times G-Grandmother. 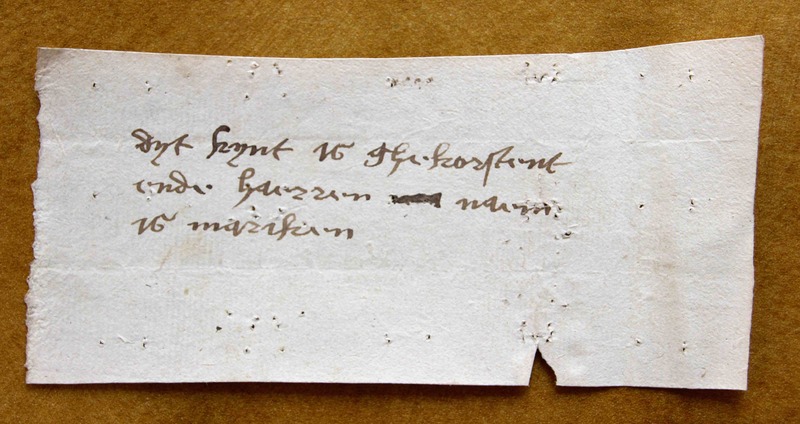 I will continue to try to find more information about foundlings in the Netherlands. Thank you for this post. You are welcome. Have fun digging in the past!